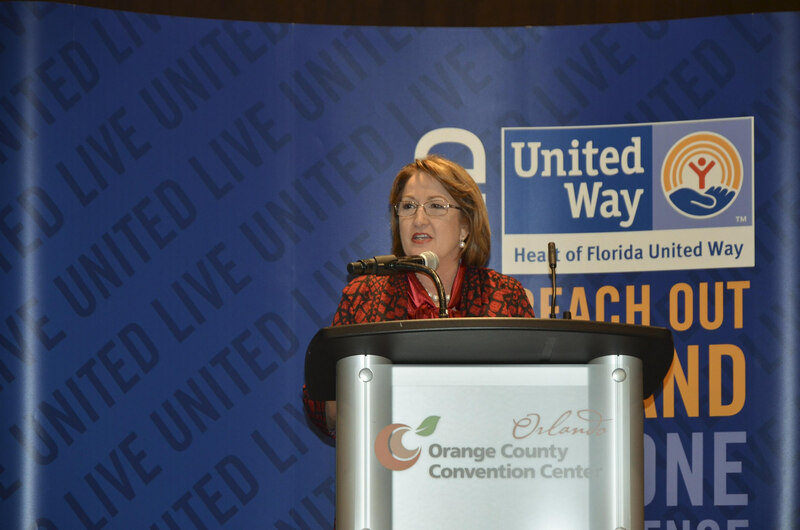 Mayor Teresa Jacobs joined Orange County employees at the Orange County Convention Center for the 2015 Heart of Florida United Way (HFUW) Campaign’s Victory Celebration luncheon. There was much to celebrate because the County’s employees contributed an impressive $501,745 this year to the local nonprofit through fundraising efforts. This year’s campaign exceeded the previous year’s contributions by 16 percent. For 90 years, Heart of Florida United Way has been at the forefront of health and human care services in Central Florida. Orange County Water Division Manager Jacqueline Torbert said the dedication and commitment of Orange County employees to the community is evident in its steadfast participation and collaboration with United Way. In addition to payroll deduction, Orange County government employees worked together to raise money by participating in various activities such as sports tournaments, raffles, bake-offs, cook-offs and more. Bob Brown, CEO and President of HFUW, said the organization benefits one in five people in Central Florida. Brown said the organization aids the community in different ways, and is essential to Orange County. HFUW has been involved in Central Florida since 1939. Since the beginning, the organization has been carrying on the tradition of helping those in need in Orlando, but has since changed its focus to prevention with a philosophy called Investing in Results. With a goal targeted toward finding a way to prevent problems affecting the community, HFUW is dedicated to focusing on education, income, health and basic needs. Photos from the 2015 Heart of Florida United Way Campaign’s Victory Celebration luncheon may be found on Flickr for use by the media.